My research on the house dorms of Douglass College brought to mind a sad and rather macabre legend I heard while I was a student at Rutgers. Mabel Smith Douglass, the accomplished woman who'd spearheaded the movement to establish the college that now bears her name, died under mysterious circumstances following her retirement in 1932. Said to be despondent over a series of personal misfortunes, she'd retreated to family property on Lake Placid, rowed a small boat to the deepest part of the lake and disappeared. A two-week long search revealed nothing, and she was assumed to have drowned. Suicide wasn't spoken of publicly, out of respect for her family, but many came to that conclusion. Years later, as the legend goes, two fishermen were enjoying a quiet morning on the lake when one of them felt his line go taut, as if he'd snagged something. With both men tugging firmly, they finally dislodged the line, and up came a perfectly preserved human body. Some said the corpse was frozen solid, with clothing still intact, which sounds highly improbable. Authorities later determined that the two fishermen had discovered the body of Dean Douglass. Having first heard the story from a friend over a few beers, I didn't give it much credence. My friend insisted it was true; she'd heard it from a college official at a talk on legends and ghosts at Rutgers. As I've learned, the story does have some elements of truth, as all good ghost stories do. It's even become a much-told local legend at Lake Placid, where Dean Douglass is known as the Lady in the Lake. Douglass did indeed have family property at the lake, and she retreated after more than a decade of tumult in her personal and professional lives. 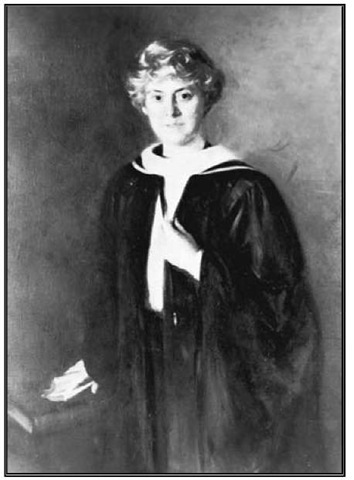 First, her husband had died in 1917, as she was working with other members of the New Jersey State Federation of Women's Clubs of New Jersey to establish the New Jersey College for Women. Following the founding of NJC, she continued to encounter resistance from Rutgers University administrators even as she strove to nurture and build the school. And in 1923, her teenaged son fatally shot himself, compounding the loss of her husband years earlier. In 1930 or thereabouts, Douglass suffered what was then termed a nervous breakdown. In the years since, it's been theorized that depression may have run through her family, perhaps accounting for her son's suicide. Chronic depression certainly could have been exacerbated by the quest Douglass had chosen for herself: more than a decade of fighting Rutgers hierarchy and lobbying the state legislature for funding. She was a determined and resolute woman, but even the greatest resolve is no match for the brain chemicals which can draw some people into melancholy. It seems that she addressed her condition in a very final way on September 21, 1933. Telling her daughter she was going out to find some foliage to decorate their cabin, she instead launched her rowboat onto the lake. Hours later, when Douglass hadn't returned, her daughter frantically called the state police. They searched the woods and found no trace of her until someone noticed the empty boat floating on the lake. Several days of searching there led to nothing, and Douglass was presumed to have drowned after falling out of the boat. For more than thirty years, that was all that was known about her death. The thriving NJC became Douglass College in 1955, a tribute to its deceased founder. Sadly, Douglass' offspring were not there to enjoy the acclaim on behalf of their mother. Her daughter had committed suicide in 1948 following her own husband's death in an airplane crash. Then, in 1963, a surprising discovery was made. Members of a Lake Champlain-based diving club were on an excursion 95 feet below the surface of Lake Placid when they found a well-preserved body. The corpse's neck was looped with rope attached to a 50-pound anchor which broke free as one of the divers attempted to move the body. Unfortunately the body started to deteriorate as it rose through the depths of the lake, virtually erasing the facial features which would have made identification easier. Coroners took a week to assess the body, finally determining from a broken arm bone that it was Douglass. Despite the divers' accounts of the rope and anchor found with the body, the cause of death was never officially changed from accidental. The remarkable underwater condition of the corpse was attributed to the mineral and salt content of the waters of Lake Placid and the near-freezing temperatures at the depth at which it was found. Jingle bells across the Arthur Kill?